Of the many hundreds – maybe even thousands – of mbaqanga or “jive” records that were issued in South Africa from the late 1950s to the late 1960s, most fell quite effortlessly into two camps: “sax jive,” which was usually instrumental and based around a saxophone lead, and “vocal jive” which broadly covered a wide range of vocal groups, from the well-known Dark City Sisters or the Mahotella Queens, to the lesser known yet no less wonderful Jabulani Quads, Zoo Lake Rockers, or the Beauty Queens. There are variants, of course, to this rule – there’s plenty of jive with electric guitar as well as earlier, “pennywhistle jive” or kwela which is really its own genre. Collector Michael Kieffer once played me a terrific jive 78 with a tuba solo! But, one of the most fascinating subgenres, and one which only very occasionally made it to 78rpm records, was the rough-hewn sound of Zulu “violin jive.” While the sax and vocal jive records were generally popular, polished music for dancing, the early violin jive records sounded like they were from the countryside, and not just because of the presence of the instrument itself – the way these artists seemingly scrape their instrument is particularly raw. One of the only early examples of writing I could find on South African popular music with violin that goes beyond a brief mention, appears in an article by ethnomusicologist David Rycroft in 1977. * In it, he describes a South African violin player in the 60s playing what was ostensibly a store-bought Western-style violin with steel strings, and with a homemade bridge and tuning pegs. The violin is held against the collarbone and according to Rycroft, was used as a “functionary replacement” of the earlier gourd-bows of the region (the ugubhu or the umakhweyana). Rycroft mostly studied the violin’s use as accompaniment to a particular type of vocal singing, and did not explicitly mention that it had been used in popular jive music, gumboot music, or had been issued on record. 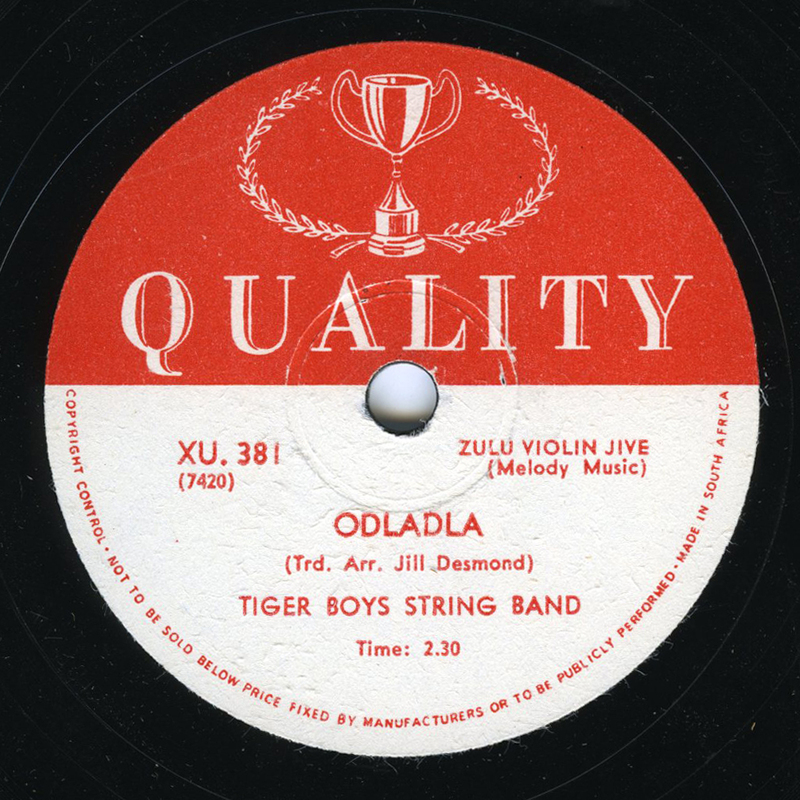 The Tiger Boys String Band, featured in this post, issued several records on the Quality label. Other great early violin artists included Richard Mtembu and the Durban Lions. Violin jive kept going until at least the early 1970s. For two excellent later examples, listen here, and here! *Rycroft, David. (1977). Evidence of Stylistic Continuity in Zulu ‘Town’ Music. In Essays For a Humanist: An Offering to Klaus Wachsmann (pp. 216-260). New York, NY: Townhouse Press.